art | Hug the Sky! Adjusting your photographs to get the color ‘just right’ can be a chore. Think about this: The Old Masters of painting spent years of their lives learning about color. Why let all their effort go to waste on the walls of some museum when it could be used to give you a hand with color correction? When Photoshop entered the CS series it included a new tool called ‘Match Color.’ This tools was made so that you could match a series of photos to one another. The seeds of a sunflower, the spines of a cactus, and the bracts of a pine cone all grow in whirling spiral patterns. Remarkable for their complexity and beauty, they also show consistent mathematical patterns that scientists have been striving to understand. Each yellow nub in the center of this daisy is actually its own miniature flower, complete with a full set of reproductive organs. The buds form interlocking clockwise and counterclockwise spirals. A surprising number of plants have spiral patterns in which each leaf, seed, or other structure follows the next at a particular angle called the golden angle. The golden angle is about 137.5º. Two radii of a circle C form the golden angle if they divide the circle into two areas A and B so that A/B = B/C. source: http://www.photojojo.com/content/tutorials/project-365-take-a-photo-a-day/ People will often say that their whole lives flashed before their eyes after they experienced a traumatic event. Perhaps it’s a bit morbid, but we think that sounds pretty incredible. When Taylor McKnight started taking a photo a day on January 1st, 2004, he never imagined the project would not only serve as a way to remember a year, but also help him understand what was important to him in his life. Whether it was his relationships, his career, or his fashion sense, recording a photo a day for a whole year left him with a rich visual history of his life. And it made him a better photographer to boot! Now that he’s in the middle of doing it for a second time, we asked Taylor to write about it for us. Read on for our tutorial on how and why to create your own daily photographic history. If you are a fan of pop art then you’re probably already well acquainted with the work Roy Lichtenstein. Roy Lichtenstein became one of the leading pop artists of the sixties with his comic-strip paintings. 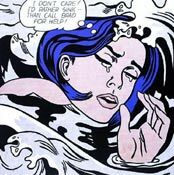 Drowning Girl 1963, shown left, is one of his better known works and is a good example of the design features in his most famous pieces. Notice the thick lines, bold colors, and thought bubble. His work also often included boxed captions and words such as “WHAAM!”, commonly found in comic books. Benday dots were Lichtenstein’s trademark. Benday dots are a printing process which combines two (or more) different small, coloured dots to create a third colour. Back in the day, pulp comic books used benday dots in primary colours to inexpensively create the secondary colours such as flesh tone. The great snow gods have not been kind to us this year. If you’re still pining for wintery white, or just hoping it’d go away, we recommend a quick (and heartfelt) appeal. Luckily, we have just the thing to melt their frosty disposition: Photojojo’s Make-Your-Own Photo Snow Globes.